I am amazed and delighted to have come second in this award. The essay took a lot of thought and care and I thought I might (just) be shortlisted – but to be on the podium of such a prestigious award was way beyond my expectations. I think the winners will be published just in print in the February/March issue of the magazine. And at Shiny, I have also reviewed the phenomenal American War by Omar el Akkad. But what struck me more was the arguments in maritime politics of the day. Conrad sailed when the traditional sailship was being challenged by the new steamship, more powerful and effective but seen by traditionalists as not ‘proper sailing’. Jasanoff writes that ‘Men trained up in sail worried that they might (in the words of one of Conrad’s characters) have ‘to chuck going to sea forever and go in a steamer’ – because going on a steamship wasn’t truly going to sea.’ Then as now, nostalgia and a search for some kernel of authenticity dominated minds. What The Dawn Watch hammers home is that ‘globalisation’ is not something invented by Tony Blair in the 1990s. For hundreds of years people have crossed borders, traded, migrated and settled. Jasanoff devotes several chapters to the novel Nostromo, which features a fight over a silver mine in a mythical Latin American country. The novel was based on the controversy over the Panama Canal in the 1900s. Nostromo‘s villain is a US investor named Holroyd who subsidises the mine – at a price. Conrad’s American capitalist says ‘We shall run the world’s business whether the world likes it or not.’ Yet isn’t this part of Jasanoff’s critique a little dated, in 2017? Today’s Holroyds would say: ‘We couldn’t care less about the world’s business and we’re going to build a wall to keep it out.’ Still, to anticipate the Argentinian debt crisis, the impact of capital upon democracy and vulture funds by ninety-odd years is quite something. ‘The only place you can go from a summit is down,’ Jasanoff writes. By the 1900s the British empire was as powerful as it was ever going to be. Contraction and disorder was inevitable. Conrad moved from writing about ideology to material interests. ‘There’s no more Europe,’ he said. The world had run out of planet to conquer and now would start fighting over the pie. Geopolitics would become zero sum. Conrad was no Tom Friedman. He knew that the times of an open world would be followed by times of nativism, protectionism, isolation, bigotry and bitterness: and so it has proved. Look at political Twitter trends and you’ll see elaborate racist theory in quasi-academic threads, extravagant conspiracies based around the Zionists or George Soros or the EU, a hysterical fear of the poor and foreign, people screaming for war and revolution. The site could have been launched in 1907 and it wouldn’t look much different from now. What comes through more than anything political, though, is just how good Conrad’s prose was. 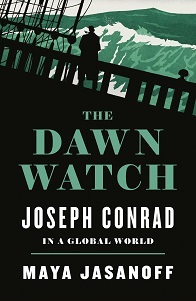 As Jasanoff writes: Conrad took his readers to the places ‘beyond the end of telegraph cables and mail-boat lines,’ onto the sailing ships that crept alongside the swift steamers, and among the ‘human outcasts such as one finds in the lost corners of the world.’ Heart of Darkness was based on the story of Belgian Congo, when the idiotic King Leopold attempted to annexe a country many times Belgium’s size by forced purchase from local chiefs who in most cases would have had no idea of what they were signing. But you don’t need to know the background to lose yourself in the novel. Conrad travelled up the Congo river as Marlow did, but he bailed five months into a three-year tour, suffering from dysentery and depression. There is one discrepancy Jasanoff notes: ‘Though Conrad had seen for himself how the Congo River widened considerably on the way up to Stanley Falls, Marlow described his passage as if walls of jungle were closing in, funnelling the travellers back in time.’ Conrad loved the open seas, but I think rivers made him claustrophobic. Although the novel is obviously problematic today – all those ‘naked breasts, arms, legs, glaring eyes’ – Conrad has his narrator begin on the Thames, talking about the Roman conquest of London: ‘this also… has been one of the dark places of the earth.’ Once Caesar’s triremes had invaded this river to conquer wild ancient Britain. The book is an exploration of fear, the fear in commission of theft, transgression, of meeting people different from yourself, and taking something that’s not yours. It is also about the fear of a world changing, of everything solid melting into air. Jasanoff shows that when Kurtz cries ‘The horror’ it’s not at inhumanity – it’s the humanity.